We Filled a Bong With Slurpee, Soda, and Booze. Here's What Happened. 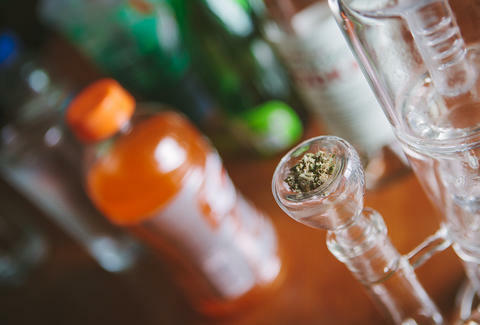 It's one of those "high-deas" that has probably occurred to everyone who's ever used a bong. What if you replaced the water with something else? Would it taste different? Would it have the same effect? In the interest of science, a team of Leafly researchers recently took the liberty of experimenting with various liquids in lieu of the standard room-temperature water. The team proposed a variety of different liquids. Some were vetoed due to the gross-out factor (milk, chocolate milk, Milk of Magnesia). A few were declined based on safety concerns (hydrogen peroxide), and some didn't make the cut because they were just too damned messy (sorry, Mrs. Butterworth's). In the end, we came up with a fairly decent, comprehensive list of liquids to be tested and evaluated. 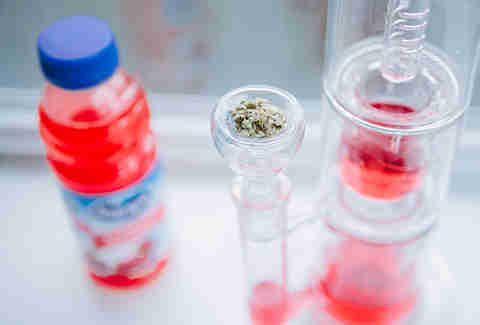 In the world of the water pipe, ice water is king. Distilled and chilled, it represents the "control" of this experiment. Discussion: It cools the smoke and enhances the crisp taste of the flower. Overall, we found it created the ideal experience for smoking cannabis out of a bong. Conclusion: 10/10: would hit again. Stepping in the opposite direction of ice water, we chose hot water from the tap. We don't recommend using boiling water for the sake of preserving the integrity of your pipe; boiling water can weaken the glass, making it more susceptible to breakage. Discussion: We were impressed with the visual effect of steam snaking out of the bong stem. Our second impression was how warm the bong felt on our hands, also a pleasant experience. Third impression: inhaling hot smoke. Spell broken. The hot water was aesthetically and tactilely pleasing, but harshed the smoke, which burned the throat on the way down, thus undermining the bong's prime directive ("First, smooth the toke"). Conclusion: Better in theory than practice. We used water-flavoring drops for this experiment -- two drops of generic fruit punch flavoring were plenty to permeate the water. Discussion: This was the only liquid that actually "flavored" the smoke, making the first few inhales taste exceptionally sweet and fruity. Unfortunately, the taste diminished with each consecutive inhale, particularly when the bowl approached cash-out. As the greens disappeared, so did the fruity deliciousness. Conclusion: Quite tasty and worth trying. Be warned, though: it did stain the bong pink for a while. Amazing idea, right? Combine two of your favorite minor vices. What could go wrong? Answer: everything. Discussion: Nope, nope, nope. This was easily the worst experience of the liquids. You can taste the alcohol vapor and it is TERRIBLE. You know that feeling when you stick your nose into a tumbler of strong whiskey and the alcohol vapor is so strong it feels like it will burn your nose hair off? It's like that, only worse, because you're actually trying to inhale ALCOHOLIC SMOKE, which is exactly as terrible as it sounds. A scientist we know was mildly aghast that we even tried it. "Not advised, or safe," he told us. "Huffing alcohol fumes is toxic." Conclusion: Learn from our experience. PASS. Cranberry juice came highly recommended from several sources, mostly notably because it is thought that the acidity in the fruit juice can actually help keep your glass clean longer. Discussion: In terms of usability, cranberry juice was comparable to standard water. Almost no cranberry flavor came through in the smoke, but using icy-cold cranberry juice was pleasant, if indistinguishable from tap water. Conclusion: Worth the substitution if you're hoping to prolong the cleanliness of your water pipe. This was by far the most popular medium among bystanders and curious friends. "How'd the Slurpee turn out?" we heard, over and over. All right. Here's your report. Discussion: This was a difficult fluid to test, mostly due to the chunky, icy consistency, which made it hard to pour into the bong without spilling (we used the blue raspberry flavor, available at most convenience stores). The bubbles were slow to emerge from the mixture, which made it difficult to inhale, kind of like sucking a really thick milkshake through a really thin straw. The smoke was cooled significantly by the slushy ice, creating a curious effect. Because the smoke was so much colder and smoother, we ended up taking rips that were much, much bigger than we anticipated. In fact, that first big hit sent one researcher into a coughing fit. After that, though, each consecutive hit was easier as the icy slush concoction melted. Although the Slurpee flavor wasn't immediately apparent, the occasional splash-back that grazed our lips during a vigorous hit was surprisingly tasty. For this round, we went high-class and created a sort of a gin & tonic without the gin. Discussion: This was by far our favorite liquid replacement, the unanimous winner of the Great Bong Experiment of 2016. If you're hoping to try this one, make sure the seltzer is chilled, fresh, and bubbly for optimal effect. The first inhale is crisp and fresh. It almost tastes like the smoke has been textured. The carbonation actually changes the smoke to make it tingle in your mouth and throat, almost like inhaling Pop Rocks. We tried it first at room temperature, then added a few ice cubes. The chilled version was far and away the better choice. The ice cooled the smoke and the carbonation altered the consistency in a most pleasing manner. Note: We consulted with a scientist to ensure the safety of this particular fluid. It was relayed to us that, in moderation, it is highly unlikely that this liquid would be dangerous. However, just for good measure, be safe and proceed with caution. Conclusion: Winner, winner, chicken dinner. The only fluid I would consider using on a regular basis and/or recommend to others. This article was originally published as "The Leafly Bong Experiment: What Happens When You Replace Bong Water with Other Liquids." For this and more articles on cannabis news and culture (including more bong water hacks and horror stories), visit Leafly News.